Environmental activists are being killed in record numbers, with at least 116 deaths reported last year, according to a report. UK-based group Global Witness claim two people around the world are killed each week campaigning against environmental destruction. The number of activists being killed has jumped 20 percent in the last year, while the group speculates actual figures could be even higher. Nearly three-quarters of reported deaths took place in Central and South America. 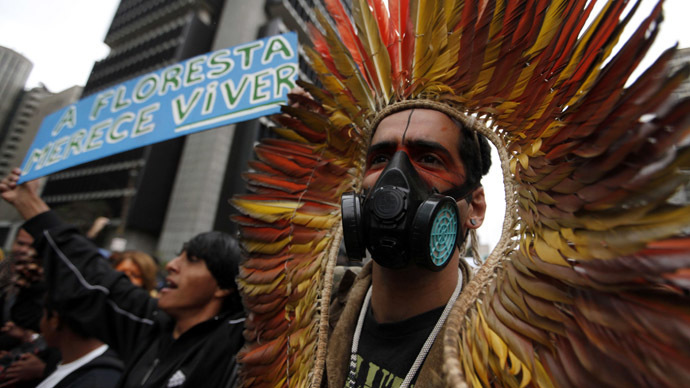 Some 40 percent of victims are indigenous peoples, protesting against hydropower, mining, logging, water and land grabs. Honduras was listed as the most dangerous country per capita, with 101 deaths between 2010 and 2014. Brazil, Colombia and the Philippines also ranked highly. Three of Cáceres’ colleagues have been killed since 2013 for fighting against the Agua Zarca hydro-dam on the Gualcarque River. Opponents of the dam say it will cut off a vital water source for hundreds of indigenous Lenca people. Cáceres, who is winner of the 2015 Goldman Environmental Prize, said she is being persecuted by supporters of the dam. “They follow me. They threaten to kill me, to kidnap me, they threaten my family. That is what we face,” she said. Two of Cáceres’ children have left Honduras over safety concerns, while she has faced “fabricated” criminal charges, according to Global Witness. The group speculates the official number of deaths is lower than the actual figure, as many killings take place in remote areas and are not reported. Global Witness gives another example of three tribal leaders of the indigenous Tolupán in Honduras who were killed by gunmen attacking an anti-mining demonstration. Armando Funez, Maria Enriqueta Matute and Ricardo Soto had received death threats warning them to stop their activism. “The true authors of these crimes – a powerful nexus of corporate and state interests – are escaping unpunished. Urgent action is needed to protect citizens and bring perpetrators to justice,” he added.